If you have any questions or want to enquire about dates, use our form to contact Guido Manfredi or see their website for more information. An organic farm specialising in Chianina cattle, fragrant olive oil and white truffles; utter tranquillity one hour from Florence. Delightful Guido and others have worked hard to provide somewhere stylish, bio-sensitive and beautiful to stay on this 500-hectare nature reserve/farm. Three farmhouses here, all with sweeping views. Le Trosce – one floor but several levels – is for one big party. Doderi is divided into three apartments, simple and minimalist; 60s retro furniture add style, originality and colour. The apartments in Brentina, deeper in the woods, are a touch more rustic – designers will love their whitewashed simplicity; all have books and delicious bathrooms. Outside: chic patios and pools. Down at the farm: a vegetable and herb garden, orchards, pigs, hens and a very warm reception. Nature trails entice you to explore, so forage in the cool shade of the woods in the truffle zone or stumble upon a ruined ‘casa colonica’. Lovely old Montaione, San Miniato and Certaldo Alto have festivals throughout the year. Minimum stay: 2 nights, 7 nights in high season. Swimming pool open May to September. 15 December - 9 March. Dinner available on request. Restaurants 10-minute drive. Extra bed/sofabed €15 per person per night. The remote setting, sweeping views, contact with nature will transport you to a very peaceful state. Interior spaces are full of light and space, simplicity and charm. You could spend your entire stay just walking Barbialla's nature trails, sampling goodies at the farm's shop or napping under fruit trees, but the kind staff will also help you explore the authentic Tuscan territory that surrounds. Barbialla is a very special place. We stayed In Doderi Alto- the upper floor of a delightful converted farmhouse high up in the Tuscan hills. All three bedrooms had ensuites and plenty of room for 6 adults though we were only 4. During our stay we saw wild boar, deer and badgers wandering about in our garden at night and at dusk. Staff were helpful friendly and knowledgeable and plainly love working there. A relaxing truly 'get away from it all' break but with great wifi if you have to stay in touch with the outside world. Accommodation was comfortably rustic but with 21c plumbing! This was our first experience of Italy and I must saw that we were off to a terrific start. Our farmhouse was huge with space to space way out in the country. It was the real Italy, the one in my dreams. Ivano and Kyra made it so easy to be there. They were beyond accommodating. Our fondest memories of our visit would be having coffee with Ivano and listening to the stories of Italy. Truffling hunting was sublime ending with wine and truffled snacks. Simply brilliant. What a great place to stay. 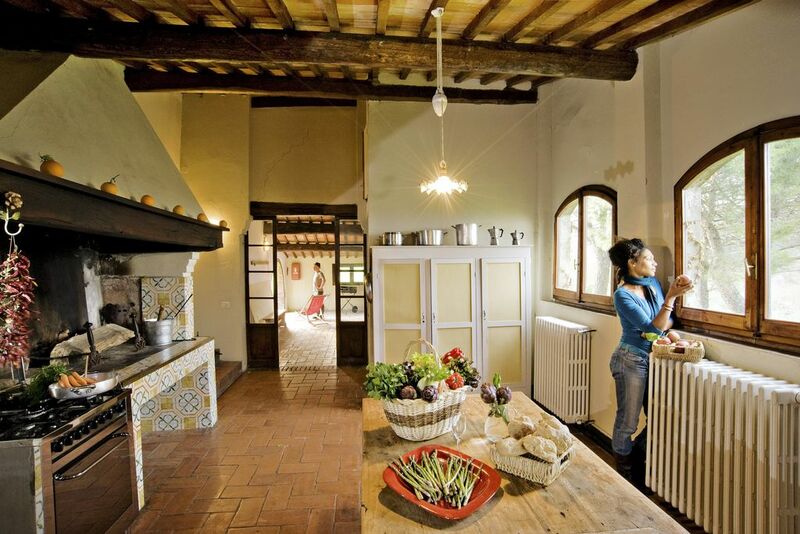 Taste the organic meat and products by Fattoria Barbialla Nuova in our short chain restaurant. Built in the middle of a garden center with a stunning view on Florence, Le Lune Ristorante nel Vivaio is a lovely place to dine. Explore the region: there are various marked walking and hiking trails on the property. At check in, you'll receive a detailed map that shows the trails which will take you past ruins and cliffs, forests and pastures. Spend a day slow-fooding it. Forage for blackberries near the lake. Take a cooking class in your own kitchen with Serenella. Visiting in Autumn? Join us on a truffle hunt in the woods. Plenty of the nearby hill-towns can be visited in just an afternoon: Breathtaking San Gimignano hosts a world-famous contemporary art gallery. Volterra has Roman and Etruscan ruins within its walls. Certaldo is home to a lively Street Theater festival. Once you're tired of nature and wild boar-sightings, venture out to see the famous Città d'Arte. Barbialla is located in the heart of Tuscany's Golden Triangle, so Pisa, Siena, Lucca, Florence and Livorno are all within an hour's drive. Everyone comes to Italy to eat and Tuscany is the center of all things organic. At check in you'll get a booklet that highlights the best farm shops, butchers, markets and bakers in the area so you can spend your time... tasting!